It has been awhile since I read a Michael Moorcock book, but back in the 1970’s I was quite enamored not just of hs popular Elric series, but his Cornelius books and Eternal Champion books as well. When I saw that there was this new Moorcock book available, I was eager to get in to it, and bumped it up my reading list. You can see, simply by looking at the cover, that this is book one in “The Sanctuary of the White Friars.” So…a new fantasy series. I’m tingling with excitement! As I began to read, I was confused. A fantasy? This reads like a biography! Michael Moorcock is the main character in this Michael Moorcock book, and he talks about his early days; about his editing; his writing; his family life. Though I don’t know anything about Moorcock, and this biography could 100% made up, it certainly offers enough little detail about his works that it feels as though the biographical details are real. Though I must admit that, being autobiographical, he does seem to put himself on a sizable pedestal and pat himself on the back more than a little (he is also pursued and loved by women and though he essentially has two wives and neither will tolerate the other, he, of course is so grand that they are willing to put up with sharing). But this is a fantasy, and not just a romantic or sexual fantasy. Moorcock slowly weaves in the fantasy story, offering hints of it early, and it’s not really too difficult to pick out, except that he does make the biography so real, so personal. But by the end of this book, the fantasy story has taken over. Moorcock writes about his life, and his occasional visits to a sanctuary he knows as the Alsacia which exists out of time, though Moorcock’s visits bring him in touch with figures from the past (including, but not limited to, the three (four) musketeers). It is through his connections at the Alsacia, that Moorcock learns he has an ability to travel through space/time/alternate realities, and this ability is encouraged and developed with help from the friars who oversee the Alsacia. These friars, it seems, have been charged with a special duty to protect a holy object, and Moorcock is brought in to the holy war. Although this is a book one, it does stand alone as a solitary book, with enough of a tease to get you to want to read more (as opposed to what I despise, which is a book that doesn’t conclude its story). I’m definitely interested in reading on in this new series. Moorcock does a masterful job of weaving his biography and his fantasy. It’s like an Escher painting in words, where it starts out with one look, and slowly changes until it has a completely different look to it. It’s a brilliant piece of writing. Fans of Moorcock and fans of strong fantasy series’ should enjoy this book, though it does take a little effort to get past Moorcock’s ego, especially early in the book. Looking for a good book? A biography that’s not a biography? A religious theme that doesn’t pertain to any religion? 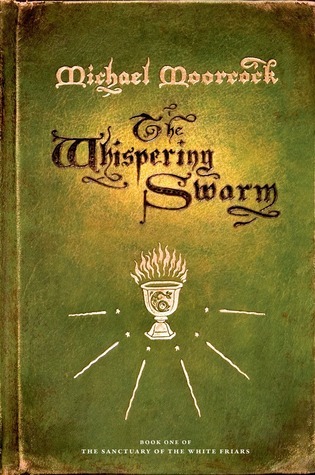 Master fantasy writer Michael Moorcock delivers the unexpected (just as you might expect from Moorcock) in this book, The Whispering Swarm.